Some months ago, we posted a testimonial of @Aura Vida who shared about how her teenage son came out of his shell and started becoming more outgoing after Life Coaching. That very day we posted the story, we received a message from @Baba Rodriguez. She asked if we could coach Baba’s son Chino. Gladly! I had two sessions with Chino with very exciting results! After the second session, I walked with Chino to his parents, Baba and Ino as they were having coffee at the nearby shop. And, true enough, a few days later, Baba sent me an eager SMS message asking me “what did you do to my son? !” smile emoticon I was sooo excited to hear from her what happened. 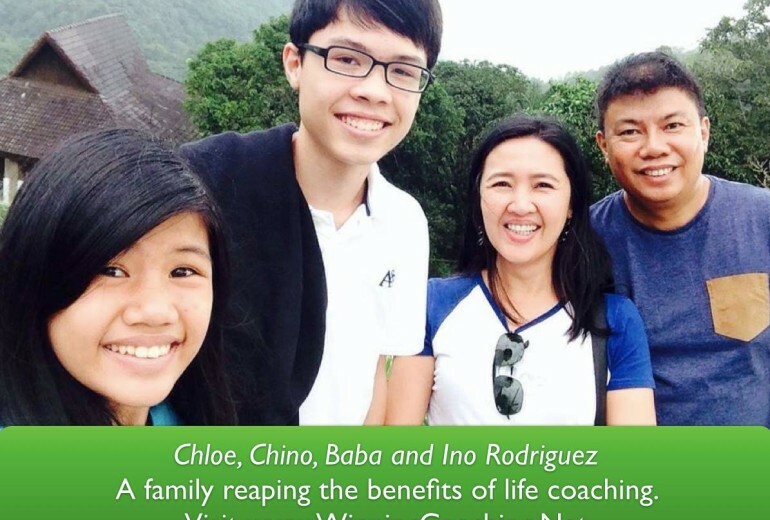 Here’s Baba Rodriguez’ story about how Life Coaching has made a huge impact on their family life wink emoticon . My heart was broken and I felt inadequate as a mother because I could not motivate him despite some efforts. Chino is a talented teenager. He plays the violin and the viola and plays those instruments very well. But when it comes to making friends with new people, or even those he knew for years already, he becomes very shy and timid. His teacher explained to me that in a group project, Chino would sit away from his group, he does not contribute and his group would go on like he was not there. That night, by some good fate, I was going through my Facebook feeds and chanced upon Winning Coaching with a story about a mom with a teenage son who used to have difficulty communicating and expressing himself. It was like she wrote about my son! I acted upon my instinct immediately and sent Edwin a message of help. By the third quarter of this school year, Chino’s classmates elected him as the Class President. I see him very happy with his relationship with his classmates now. I see him happy with his newfound self. His passion for playing the violin is also more evident. But the best was the night when he spent more than two hours talking to me, sharing his views about life, his fears and what he looks forward to about his future. What sweet music to my ears are the words of my son! Thank you Coach Edwin. May your gift continue to overflow. (Note: Story and photo published with permission from both Baba and Chino). Thanks so much Baba for sharing your story. Attached is a photo of the Rodriguez family: Chloe, Chino, Baba and Ino . In Winning Coaching, we believe that it’s not only our clients that experience the blessings of coaching. Their entire family and circle of friends/colleagues benefit from the coaching too! Find out more about how Winning Coaching can help you have an even more happy, successful life!